A group of teens blame Raymond for the accidental death of his younger brother, Bryce. Six years later he returns to their hometown for revenge. I have a bit of a soft spot for amateur horror movies because, while I may have thought to myself “I could make a better movie than this!” a few, oh…thousand times, these are people who have actually gone out there and done it. So, while I’m not sure that this post will end up sounding all that positive, I do actually hope that this has led to bigger and better things for those involved. 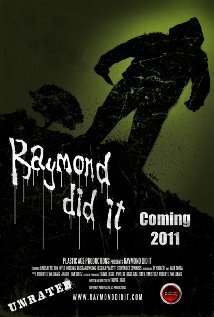 With that being said, Raymond Did It is…well…it’s not great. While the acting of the adult versions of the characters were markedly better than that of the kids in the opening scenes, it was still marred by moments where the actors seemed to have either forgotten their lines momentarily, or where they’d decided to take inappropriate pauses. And while Lindsay Felton stood out as being less amateurish than her peers, even she had her moments. The story also didn’t necessarily make much sense. Given that Raymond being cognitively impaired is pretty much his defining characteristic, I’m not sure that it makes sense for him to come up what turn out to be some pretty elaborate means of killing some of his victims. On the other hand, they look really cool – and are, by far, the star of the movie – so…maybe I’ll just shut up and enjoy them for what they are.